EVERY YEAR, the employees at Hawaiian Electric Co. conduct various fundraising activities for the Aloha United Way. 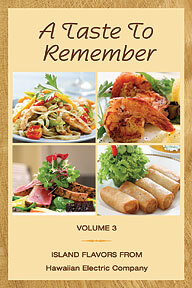 This year the campaign includes a cookbook of favorite recipes, "A Taste to Remember -- Volume 3: Island Flavors from Hawaiian Electric Company." The book will be available for $10 beginning Tuesday at HECO's customer service offices on Richards Street (across from the post office) or on Ward Avenue across from the Neal Blaisdell Center. To order by mail send $10, plus $4.50 for shipping for one to two books, or $8.50 for shipping three to 10. Make checks payable to HECO and send to HECO Power Supply Engineering, P.O. Box 2750, Honolulu 96840. Call 548-7311. "IF YOU ARE a garlic and crab lover, this dish will knock your socks off! Have some fresh baguette bread on hand to soak up the sauce." Place garlic, onion, butter, salt and red and black pepper in a roasting pan and place in oven. Watching carefully, cook until onion and garlic turn golden brown. Add crab (shells and all) and mix well, making sure crab is well-coated. Return pan to oven; raise temperature to 475 degrees and cook 15 to 20 minutes, turning crab every 5 minutes. Place crab on cooked rice on large serving platter. Pour garlic sauce over top. Sprinkle with parsley and garnish with lemon. Serve immediately. Serves 2. Approximate nutritional analysis, per serving: 1540 calories, 93 g total fat, 58 g saturated fat, 285 mg cholesterol, greater than 1,400 mg sodium, 150 g carbohydrate, 3 g fiber, 5 g sugar, 27 g protein. "OUR FAMILY loves these brownies so much, that even though the instructions say to freeze the brownies for one hour, we can't wait, so we eat them warm from the oven and they're heavenly! If you like dark chocolate, you'll love these brownies." Preheat oven to 325 degrees. Line an 8-inch square baking dish with a 12-inch square of foil, shiny side up, pressing foil into place. Spray with oil. In a large, heavy saucepan, combine unsweetened and semisweet chocolate, and butter. Melt over low heat, stirring occasionally, until smooth. Remove from heat, stir in salt, vanilla and sugar. Beat in eggs, one at a time, until incorporated. Add flour and stir until mixture is smooth and shiny, and comes away from side of pan, about 1 minute. Stir in nuts. Spoon mixture into prepared pan and smooth surface. Bake in bottom 1/3 of oven for 40 minutes, or until a toothpick inserted into center comes out clean. Let brownies cool completely in pan, then put in freezer at least 1 hour, or until firm. Cover pan with a cutting board and turn out brownies. Gently remove foil and turn brownies right side up. Use a thin knife to cut into 16 bars. Note: For best results, use real sugar, not Splenda. These brownies are dense and fudgelike at room temperature. When served cold, they have a chocolate-caramel quality. Approximate nutritional analysis, per serving: 220 calories, 15 g total fat, 7 g saturated fat, 40 mg cholesterol, 50 mg sodium, 21 g carbohydrate, 2 g fiber, 17 g sugar, 3 g protein. Last week's recipe for Crisp Coconut Cookies included an incorrect oven temperature. The cookies need to be baked at 300 degrees.